It's been a busy week at Kyandra. Not in the decorating sense but in the family sense as life gets back to normal after the school holidays. I do enjoy getting back to work as it gives me a chance to catch up with friends and share holiday stories with my students. They are always so keen to let you know all about their adventures. but the weekend promises to be better. Time to get out in the garden and tidy up a bit. 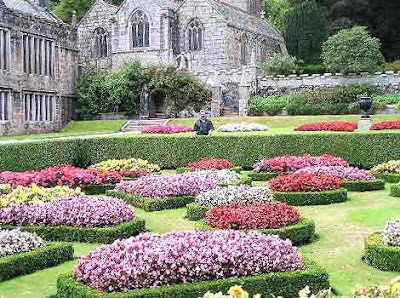 Thought Iwould share some photos of gorgeous formal gardens. I do love formal gardens.....the clipped hedges and topiaries. Just gorgeous... I tend to use gorgeous alot.... need to come up with another word..
Would love to live in this house but would need to hire a gardener...this may be tooo.... much to trim...clip....weed and feed!!! Oopps I did have more pics but they disappeared somewhere??? A peak at our garden. Yes I do have hedges and I absolutley love them. The best hubby in the world is in charge of clipping...he has one of those electric clipper thingys...Makes clipping much easier. Well it looks easy to me. Rachael from A Room For Everyone and Nellie from McCarthy designs your kind words and encouragement are very much appreciated. Hi Kym. What a gorgeous garden you have. It's absolutely stunning...and so green. Sorry about my l-o-n-g comment yesterday! I just read it back and hope you understood it - it was a little all over the place because I was so excited to leave some feedback! What I meant regarding painting furniture was that if you have a white item, and then paint it black, you can't distress or age it without the white coming through. Of course, if you're not planning on distressing the piece then you can paint it over and over again in any colour you like. Kristine. I love your garden , you & hubby must be so proud when you look at it. You got my attention when you said "I love all things french " . I will be a follower & look forward to your future posts.